Other readings are listed on the schedule Instructor: John H. Krantz, Ph.D.
What is learning? How do we learn? How is it different from that other course we teach here called Cognition (PSY 333)? These are the topics of this course. Briefly learning is the acquisition of new behaviors as a results of experiences in the environment. We will develop this definition further in the class. This course will examine the discoveries and applications from this area of psychology. In many ways these discoveries form the foundation of much of our other knowledge in psychology. We will also take a look at the controversies that have arisen as a result of how this knowledge has been interpreted. Much, but not all, of the material in this course is grounded in the behaviorist tradition so we will have to examine the implications and range of ideas that the term behaviorist encompasses. This grounding of a set of findings in a tradition that makes many of us uncomfortable in its implications will give us a good opportunity to examine the nature of theory and the relationship between theory and data. This course is an upper level course and an upper level lab course in the psychology major. Thus, in this course there are several specific objectives that relate to the position of this course in the major. As you advance, we hope to give the psychology major is designed more ownership over your education. This objective is reflected in several ways in this course. First, like all 300 level courses you will be required to design and conduct your own project. Secondly, you will find a greater emphasis on primary literature. Thirdly, you will take greater leadership in the course leading some discussions. This course also is being taught at Hanover College. When you graduate you will be given a degree: the Bachelor of Arts. You do not get a degree in Psychology. You only get a major in Psychology. The difference is that we believe, or at least hope, that all students leaving this school have attained something that is common to all students. We hope you are educated, at least foundationally. Towards that end, all courses need to help develop skills needed by an educated person. These include analytical thinking, evaluation of evidence, development of new ideas and the testing for these ideas, and the articulate dissemination of our learning. These skills are crucial to all facets of your life, your careers included. Thus, this course will require discussion of the material in the class, oral presentations, independent research, and writing. Exams are all essay and comprehensive. They will ask you to critically examine the issues discussed to that point in the course and to draw from multiple areas to reach a conclusion. There will be two exams, a mid-term and a final. It is possible they will be take home. As this is an advanced course, one of the tasks you will be given will be to lead a discussion and critique of one or more journal articles. Critiquing a journal article is one of the basic skills required of an educated person. Being able to evaluate another person's claim is key to being able to think independently and not have to follow along after experts. As such, this class will required you to demonstrate this ability. It is also an ability you will be asked to demonstrate on your comprehensive examination in psychology. Read more about this assignment here. In addition to the research journal article, you will be asked to present an article the presents or discusses a clinical application of one of the topics of the course. There have been many applications and we cannot discover them all, but it is worthwhile to view of this course material has been applied to clinical issues. Go here for more about this assignment. Part of the purpose of the 300 level class in the psychology major is to expose you to different research methodologies. In Social Psychology you learn group testing methods, in Adulthood and Aging you learn qualitative methods; and Cognition, you learn repeated measure designs. Much of the field Learning is also dominated by a unique methodology, the single subject design. This method is somewhat similar to what is done in Sensation and Perception, for those of you who took that class. So these labs will work to teach you how to use individual subjects to conduct complete experiments and reach sound conclusions. We will complete two, but I am not sure if we will have a chance to do three before you need to concentrate on your final project. The lab reports will be written according to APA format including all sections (abstract, introduction, method, results, discussion, references, etc.). You are expected, since you have had research methods, to be familiar with APA format. What you have forgotten you can look up in books in the library. I am very serious about this. On your labs your will received two grades, one for the content, one for following the format. The final grade is the average of the two grades. Any error will lead to an automatic F on the format portion of the grade, but the paper can be resubmitted for format errors but with no higher a grade than a C on that portion of the grade. So this part of the grade should be easy to get an A on. Let us see how much you can impress me. Lets have some fun here. Well, I hope a lot of the course will be fun, but this task can be particularly entertaining. Conditioning principles are the basis for the tricks that you see at Sea World and lots of animal shows. In this class, take what you have learned, and use conditioning principles to teach the animal to perform some trick. You will demonstrate your animals success or lack of it on the last lab session. You will also write a formal paper where you will discuss your approach, the principles you used, discuss your history of your work, and make conclusions about how you successfully or not used conditioning principles. (This is still written in APA format). Ok, let me give some ideas off the top of my head. 1) teach a rat to run a maze without error or prevarication. 2) teach the rat to move a ball through a maze. 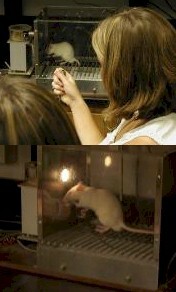 3) teach the rat to hit various objects in a certain order. 4) create an obstacle course for the rat. 5) Have it stand on its haunches and play dead under your control. Be creative. Other hints will be forthcoming. Criteria will be complexity of behavior, reliability of the rat following the command, as well as details in the presentation and write up. Just a note, by the second week have your idea and start the conditioning in parallel with your other labs.